A few months ago I realized that this year would be my 20th High School Reunion and all of a sudden I began to feel my age. I developed arthritis in a few knuckles, I tore a tendon in my right elbow, and my left knee developed tendonitis. In all honesty those things didn't all happen after my realization but they have all happened in the last year or so. Hence, in reflection, I began to feel quite old in my little 5'1" body. However, let me tell you, in my not so little mind, I AM NOT OLD! Do you hear that? I AM NOT OLD!!!! (ok, that one should've been loud enough...it had 4 exclamation points). So I've decided that as I head back to my hometown this week for my 20th high school reunion, I am NOT going to feel old. As I visit and give 3 school presentations at my former elementary school, I am NOT going to feel old. And as I meet the children of my childhood best friend as I crash on her couch, I am NOT going to feel old. My friend and I are going to stay up late (like til 10pm...if we can make it that longl) talking girl talk, eating popcorn and braiding each other's hair. Because I am NOT old. I'm going to stand next to the tallest 5th grader at my elementary school and relish the fact that he/she is taller than I am so therefore...I am NOT old. And finally, I'm going to dance like I'm 16 again at the reunion, telling my aching knees, hands, feet and elbows to stuff it, because...I am NOT old. Signed with a Literary Agent!!!! That's right. I just signed with Literary Agent John Cusick with Greenhouse Literary Agency. I've been repped by an art rep for the last 7 or so years and it's been just fine. They brought me jobs illustrating everything from books to asthma medication. However, I reached a point in my life and my career where I felt I needed to evolve, to change things up. I felt I needed and wanted to focus on only books and work on writing and illustrating the whole project myself. After a long talk with my art rep, we came to the understanding that since I wanted to focus more on writing (which they couldn't help much with), I needed to choose the path which suited my goals best. So, I nervously parted ways with them and signed on with John. John and I met back in 2012 at a WIFYR conference and had kept in touch. It was a natural progression to sign on with him and jump more fully into the writing AND illustrating of picture books. Read John's wonderfully written account of it all HERE along with my answers to some introduction interview questions. This week I will be doing the evening story time at the Orem City Library (located in Orem, UT). So if you would love a free night out with the family, come on by. It is Tuesday, July 22nd at 7pm in the storytelling wing of the children's section. 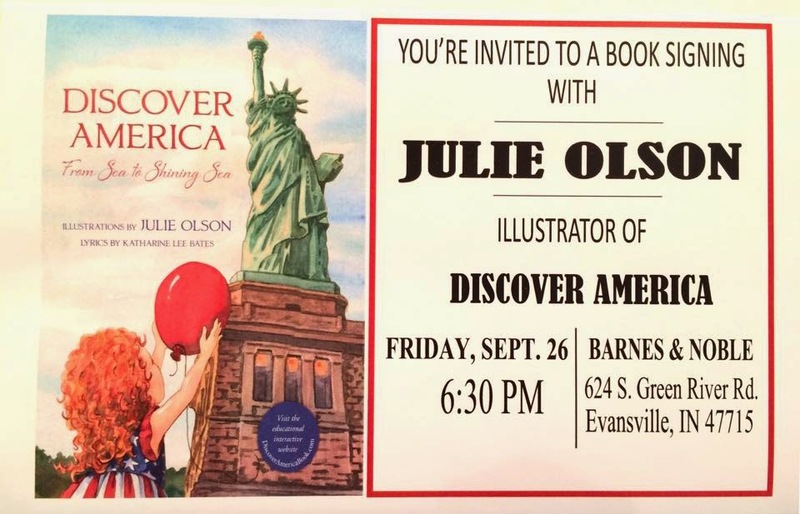 Join local author, Julie Olson, for a reading and signing of her new picture book, Discover America: From Sea to Shining Sea. Follow the patriotic journey of a little red balloon as it makes its way from the West Coast to the East Coast of the United States. Accompanied by the words of one of America's most beloved anthems America the Beautiful, From Sea to Shining Sea shows the diversity and beauty of our great country through the eyes of our nation's children. To add an interactive experience, kids all across the United States will be able to go online to send their own balloons on their own journey. 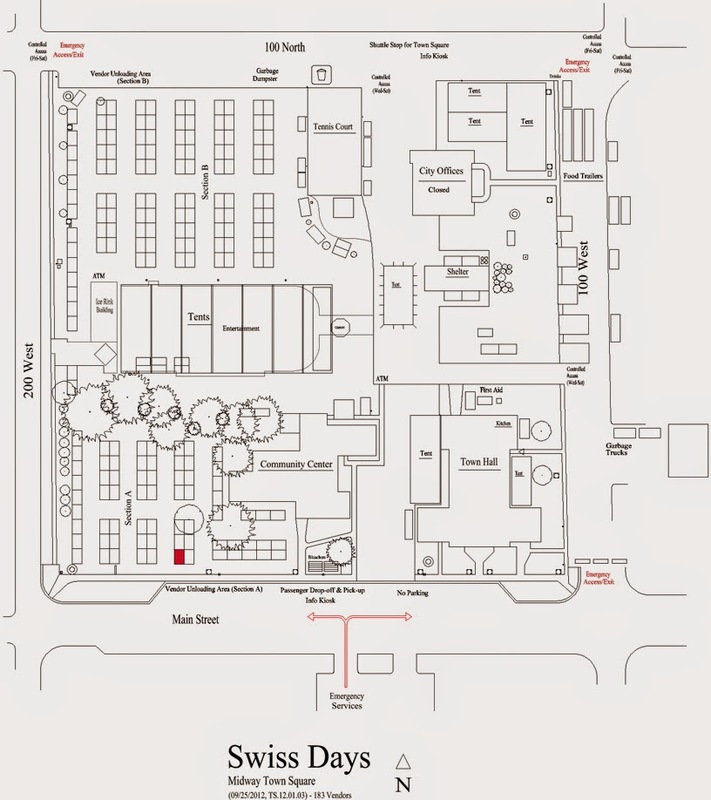 Places in the signing line are reserved for those who purchase a copy of Discover America: From Sea to Shining Sea from The King's English. GET YOUR COPY NOW! Preorder your signed copy ofDiscover America: From Sea to Shining Sea today, by either calling the store at 801-484-9100 or ordering online. Please specify if you will be attending the event and if you want your book personalized. 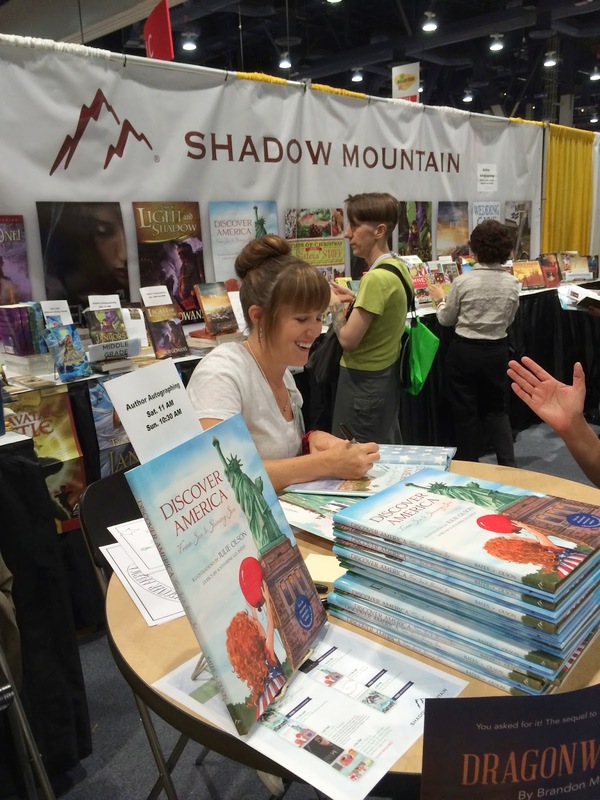 This year I was invited by my publisher, Shadow Mountain, to come to the American Library Association Conference held in Las Vegas to sign books in their booth. They put me up in a nice hotel, fed me a wonderful dinner, and treated me like an all out star. They are AWESOME publishers! The goal for publishers at ALA is to get their books into the hands of librarians, teachers and readers across the country so they will spread the word about how awesome a book is. The perk for those attending ALA, is that they get a TON of free books (with the understanding that they will post reviews and share which books people should buy). The publishers bring in authors to sign their newly released or soon-to-be-released books and it is just a FAN FEST. 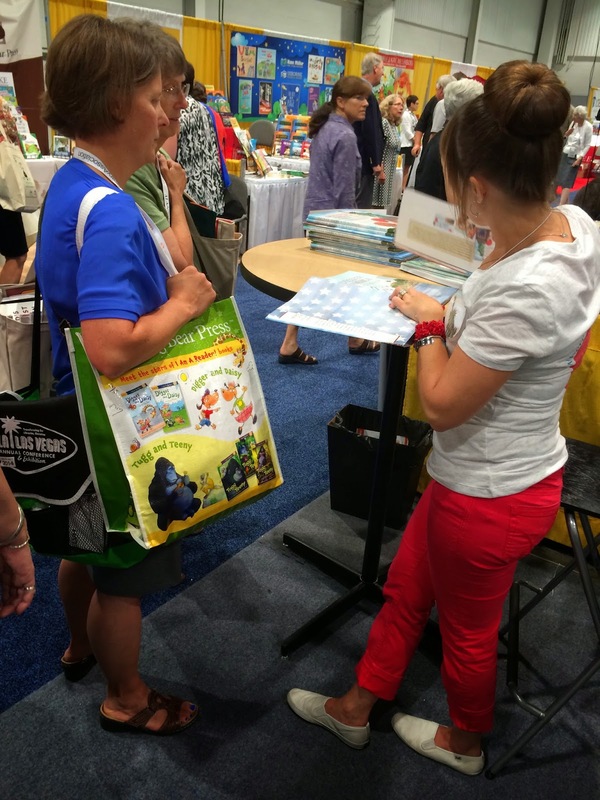 Many long lines & many short friendships later, you walk away excited to read a book and share it with the world. 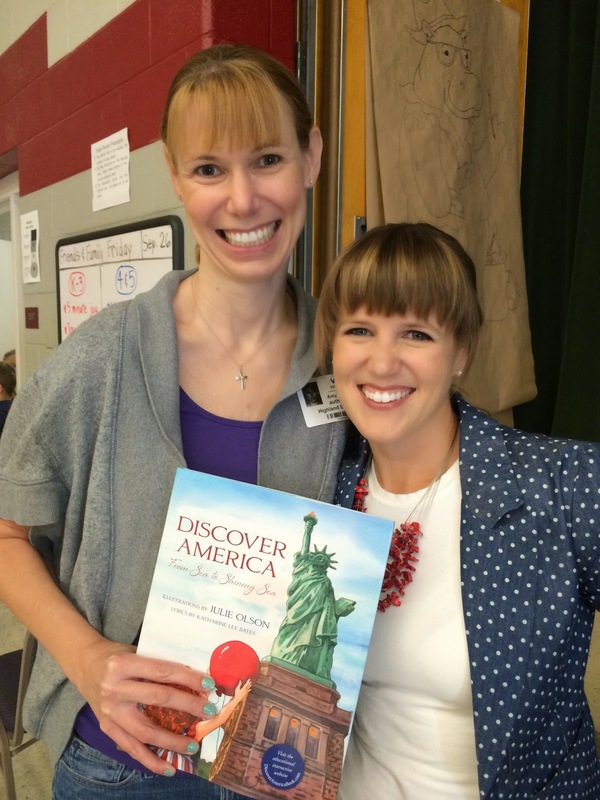 My illustrator friend, Apryl Stott, met me at the conference and worked with me to promote my book and helped out at the signing. It was so fun to see her there and to spend some time catching up. I signed on Saturday and Sunday mornings for an hour each time. On Saturday, the line of people wanting me to sign a book for them was amazingly long (some of the people in line told me my line was as long as the Caldecott winner David Wiesner's line). I hope they all like my book as much as his. :-) I was humbled by this turnout and so grateful for the positive comments people gave me on my book, Discover America: From Sea to Shining Sea. All in all I had a wonderful time, a wonderful experience and a wonderful trip. Thank you to all the amazing teachers, librarians and book lovers out there. KEEP READING!!! I was told by people in line that my line was as long as Caldecott Winner, David Wiesner's line. I don't know about that but I did sign for an hour straight. I met so many nice people, teachers, librarians and even kids. This little girl was the highlight of the signing. She even signed a book she made with her dad for ME! I was honored. I had Tshirts made for my friend Apryl and I to wear the first day...a bit of advertising for the book. It worked. Kevin Henkes signed a book for me and asked for one of my postcards. I got to meet Markus Zusak, author of The Book Thief. He was so kind and personable. Molly Idle signing and discussing technique. I can't believe she only uses colored pencil. Me and Melissa Sweet. Her collages are beautiful! Me and Karen Zelnick, Marketing Guru for Shadow Mountain Publishing, at the Publisher's Dinner at FIX in the Bellagio. Yummy food. Great company. Second signing on Sunday Morning in the Shadow Mountain Booth. I signed out of all 250 copies the publisher brought to the conference. They were very surprised and pleased to place so many books. I was surprised and pleased so many people came to the signings. 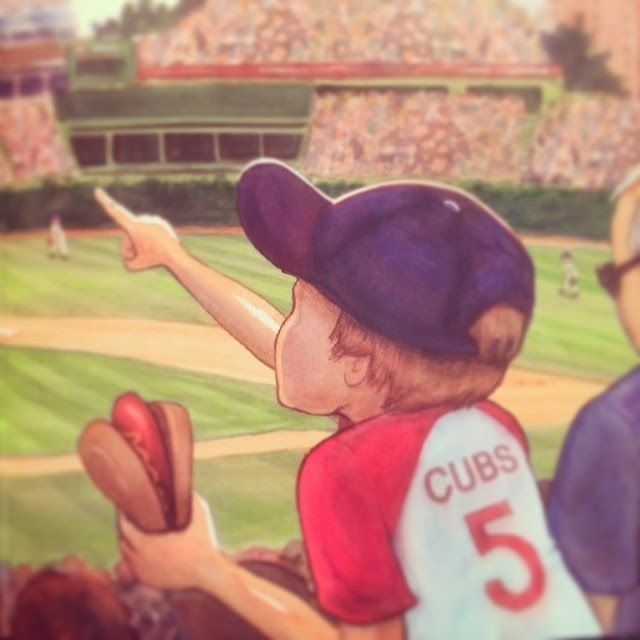 One of my illustrating/story telling heros, Aaron Becker. He signed one of his books for me and I signed one of mine for him. Nice exchange. Very kind person. I also got to meet up with some of my Utah author friends. Here's me snagging one of Ally Condie's ARC's. Loved the book by the way. We sat together years ago at a signing in a Christian bookstore, before she made it big. Now look at her. What a sweet, kind person she is. 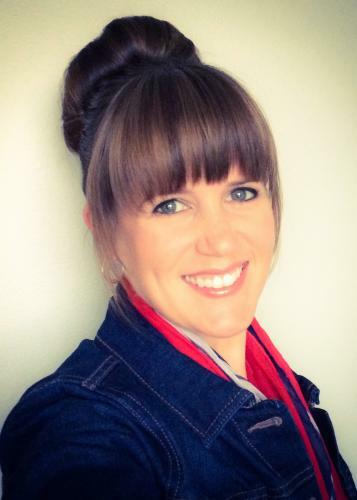 She is a wonderful mom to her kids, author for the YA market, and friend to all. YAy Ally! Getting a quick hug and an ARC from my wonderful friend Carol Lynch Williams. Read her stuff! It's good! Meeting Oliver Jeffers, hip, cool, creative author/illustrator. My haul of books from ALA. I've snagged time to read a few of the Novels and all of the picture books. Love 'em! Good stuff. I'm a lucky gal. My kids love the books too! Book Reviews for Ally Condie's "Atlantia" and Ilima Todd's "Remake"
I was so excited to get an Advance Readers Copy of Ally Condie's "Atlantia." I'll try not to give out any spoilers here (even if you want me to), but I will say that this is a wonderful story of independence, loyalty, family relationships, love, and sacrificing for the greater good. I like the fact that this book kind of deals with 2 (well also mentions a 3rd) civilizations. While it focuses mainly on one, you get glimpses into the other. The one it focuses on, Atlantia, is fascinating and created wonderful visuals for me. (I'm ready for a whole Disneyland or Sea World theme park just focused on this place). It was nice to "live" in an undersea world for a while and not in the usual grime of dystopian futuristic novels. I appreciated Condie's ability to focus on the inner struggles of Rio, the main character, while giving us the sense of the personalities and struggles of the other characters as well. I'm not a fan of when authors jump out of the main character's head and into another's just to be able to tell the whole story. But Condie didn't do this and was still able to tell the WHOLE story. I love that Rio is a strong female character who makes her own choices without ever sounding like she's whining, even when she gets frustrated or down. "When I was growing up, I often felt trapped by the constraints of my voice, the concerns of my family, the confines of my city. ...I know I am no longer trapped." I was so excited to get an ARC of this book. Lucky me! When it's available to all, I highly suggest picking it up. Fun, yet thoughtful read. On the surface, it's a story about gender, choice, and freedom. However, it made me think much deeper about how the relationships we form actually free us to be who we really are, how the choices we make others may see as confining and limiting to our personal freedom. However, those relationships and choices actually make us grow and become more than we ever could have without them. This book fit right in the dystopian genre, however I really liked the imagery and real-world elements of the island life in the middle. It made me feel even more connected to the world she created (maybe that's because I dream of living the island life). Some people may say, "oh this part is like this other book where people get to be made pretty," or "she named the main character NINE...she must've just added the number 5 to FOUR from that other book." But even though parallels can be drawn (LIKE WITH EVERY OTHER BOOK THAT IS IN THE SAME GENRE), Ilima does a great job in making every character and plot choice relevant to the book. So don't hate on the parts that cause you to possibly reflect on other books or stories. All stories spring from the same elements, and when a book is a specific genre, there are specific elements that MUST be there to put it in that genre. But honestly, I enjoyed this book much more than those other two I slightly referenced above. I also thought the author created a believable, not-so-distant future, type of world ironically named Freedom. Yes, they have the freedom to choose who they will be on the outside, however, they are distracted by that superficial choice into giving up other freedoms. I think we are often distracted by the superficial in todays world, forgetting what's really important. The author crafts the story in a way to help the reader and the character within the story naturally form opinions on what is really important in life. Can't wait to read more from Ilima Todd!